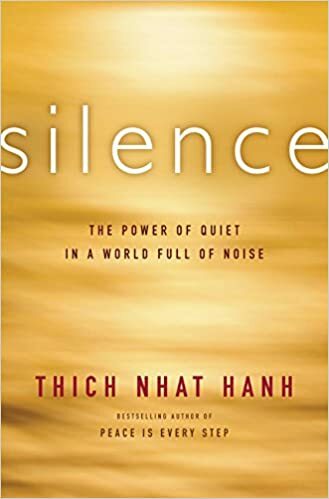 The book of the month is "Silence: The Power of Quiet in a World Full of Noise," by Thich Nhat Hanh. "Mindfulness is often described as a bell that reminds us to stop and silently listen. We can use an actual bell or any other cue that helps us remember not to be carried away by the noise around and inside us. When we hear the bell, we stop. We follow our in-breath and our out-breath, making space for silence. We say to ourselves, "Breathing in, I know I'm breathing in." Breathing in and out mindfully, paying attention only to the breath, we can quiet all the noise within us-the chattering about the past, the future, and the longing for something more." "...What does "I am here" mean? It means, "I exist. I'm really here, because I'm not lost in the past, in the future, in my thinking, in the noise inside, in the noise outside. I'm here." In order to really be, you have to be free from the thinking, free from the anxieties, free from the fear, free from the longing. "I am free" is a strong statement, because the truth is, many of us are not free. We don't have the freedom that allows us to hear, and to see, and to just be."